陶雅晋, 冯波, 易木荣, 李波, 卢伙胜, 颜云榕. 基于渔港抽样调查不同捕捞方式CPUE单位标准化新方法[J]. 渔业科学进展, 2019, 40(2): 15-24. DOI: 10.19663/j.issn2095-9869.20180226001. TAO Yajin, FENG Bo, YI Murong, LI Bo, LU Huosheng, YAN Yunrong. A Novel Approach to Unit Standardization of CPUE for Multiple Types of Fishing Gear Based on Fishing Port Sampling Surveys[J]. Progress in Fishery Sciences, 2019, 40(2): 15-24. DOI: 10.19663/j.issn2095-9869.20180226001. Corresponding author: YAN Yunrong, E-mail: yanyr@gdou.edu.cn. Abstract: Traditional CPUE (catch-per-unit-effort) units show diversity and complexity due to the different types of fishing methods, sizes of vessels, and characteristics of fisheries on which they are based, leading to problems with data incomparability among multiple fishing gear types. To assess the fish stocks in a specific areas of the sea, the impact of various different fishing types needs to be considered, but using traditional CPUE data makes it difficult to assess these stocks because of variations in the units used. We reviewed the relevant literature and screened out 24 types of CPUE units. The following processes were then carried out to standardize CPUE units across multiple fishing types. First, eight CPUE units appropriate for different fisheries were selected based on general criteria. Those CPUE units were then divided into two groups based on overall similarities and differences. The two main applicable CPUE units of kg/(kW·d) and kg/d were identified at this stage. Finally, the coefficient of variation (CV) of each of these two selected CPUE units was calculated. The smaller the value of the CV was, the more stabile the unit was concluded to be. The optimum unit was determined to be kg/(kW·d) based on this stability criterion. 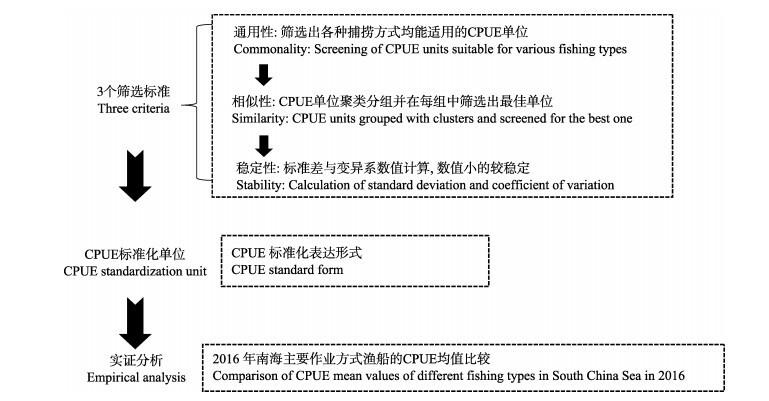 The landings of nine major fishing types in the South China Sea in each of the four seasons of 2016 were then analyzed using this optimal CPUE unit. The results of this analysis showed that the fishing capacity of different gear types were arranged in the following order: Seine > Pair trawl > gillnet > falling-net > stow net > otter trawl > shrimp trawl > pot > fishing tackle, corresponding to mean values of 29.57, 8.77, 4.96, 4.81, 4.73, 3.95, 3.11, 3.08, and 2.35 kg/(kW·d), respectively. After catch data are standardized by the optimal novel CPUE unit developed in this study, comparisons and analyses of fishing capacity among gear types, relative abundance and utilization levels of different fisheries resources, and fisheries catch statistics could be conducted with greater accuracy than was previously possible.